Editor’s Intro: The Symetri™ Clear ceramic bracket system features state-of-the-art technology. For just about as long as I’ve been a practicing orthodontist — 30 years — we’ve witnessed the orthodontic industry undergo a relatively significant evolution, especially when it comes to ceramic bracket systems. Historically, when ceramic brackets first entered the market in the mid-1980s, there was a handful of known issues with regard to removal and placement; these limitations were not immediately or easily remedied. Over the years, however, as clinical needs changed, and patient demands evolved, ceramic materials also advanced. This sort of advancement, paired with dedicated research and development as well as proprietary manufacturing technologies, has allowed clinicians like myself to meet the esthetic needs of patients — with outstanding results. In my practice in Lafayette, Louisiana, my staff and I regularly work with ceramic systems, and typically, we latch onto solutions that check a few very important boxes, including stellar esthetics, superior strength, a low profile, and ease of debonding. We’re always on the hunt for revolutionary systems that employ the latest technologies and orthodontic innovations. 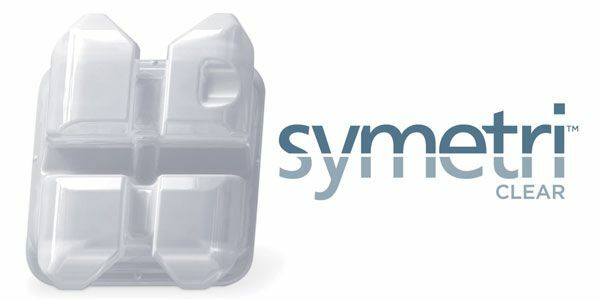 Over the past year or so, I’ve had the opportunity to experience and test out one of the industry’s newest ceramic bracket systems, Symetri™ Clear from Ormco Corporation. I’ve been able to witness firsthand the incredibly low profile, ample torque, and tie-wing strength that Symetri Clear can provide. As my friends and colleagues very well know, there are often challenges that come with leveraging a ceramic system — bracket breakage, wire notching, and difficulties while debonding. So, when deploying a treatment solution rooted in ceramics, manufacturing technologies and the ceramic materials used must meet the quality demands of clinicians as well as patients. Further, in order to ensure enhanced patient comfort and optimal wire placement and sliding, we desire a bracket with round surfaces and edges, like Symetri Clear. In just about every treatment case I come in contact with today, esthetic appeal is a priority consideration for the prospective patient. Because clear aligners aren’t a fit for each and every case, or perhaps due to clinical preference, clear brackets are the known and desirable alternative. When it comes to ceramic options, there can be a preconceived notion from doctors and patients alike that the bracket won’t function as a truly “clear” option; previous systems could appear muddy and wouldn’t esthetically complement the patient’s natural tooth shades. Since adopting Symetri Clear, I’ve noticed how positively patients have responded to the heightened esthetics. The manufacturer states that the bracket design has more rounded surfaces, which diffuse light better than a flat surface. Our team can attest that these brackets virtually disappear and naturally blend with tooth enamel. On my side of the chair, no matter the circumstances, bracket strength and ease of debonding is paramount to a positive patient experience. For patients, it’s all about the esthetics and the comfort of the bracket, and we are able to offer Symetri Clear in both arches because of the exceptionally low profile. We will still use bite ramps when needed, but I’ve been pleased to find that the smaller bracket hasn’t compromised strength. The under tie-wing area allows for double tying, making the bracket perform similarly to larger metal brackets on the market. When it comes to debonding, its proprietary laser-etched pad technology allows for a controlled surface that results in reliable bonding and safe, nondestructive single-piece removal — a win-win for doctors and patients. Patients and parents dislike emergency appointments as much as the doctors and staff. So far, we haven’t had one yet, which frankly has surprised me. We have moved into steel wires and tied with steel ligatures and have not yet seen an undesirable breakage. I’ve participated in some testing for this bracket as well as debonded some recent retreats, and the ease in which the bracket removes from the tooth with minimal pressure is truly impressive. The clear ceramic bracket system is a trending topic in the orthodontic practice. Check out this press release. Mark N. Coreil, DDS is a board-certified orthodontist. Over the past 10 years, he has worked with children who have craniofacial problems. Dr. Coreil is Associate Professor of Clinical Orthodontics at the Louisiana State University School of Dentistry and is actively involved as an orthodontist on the Children’s Hospital Cleft and Craniofacial Team. Dr. Coreil graduated from Louisiana State University School of Dentistry in 1986 and completed his orthodontic specialty training at LSU in 1988. He completed the Roth/Williams Advanced Clinical Program in 1993. Dr. Coreil lectures both nationally and internationally on a number of topics pertaining to orthodontics. Disclosure: Dr. Coreil is a paid consultant for Ormco Corporation.